After Crystal Palace secured a 4-1 win over Leicester City on Saturday evening, Wilfried Zaha couldn’t quite believe that he didn’t receive the Man of the Match award. The 26-year-old scored twice in Palace’s victory, with Michy Batshuayi and Luka Milivojevic also on the scoresheet. Those three vital points moved the Eagles up to 13th place in the Premier League table, with Zaha and Batshuayi selected to speak to BT Sport for the post-match interview. With that in mind, it seemed like a given that Zaha was set to receive the Man of the Match award, but to his surprise, Des Kelly revealed that James Tomkins had been given it instead. 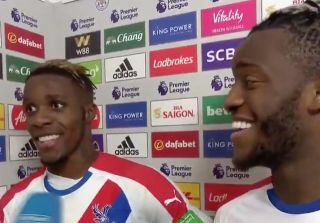 As seen in the video below, Zaha couldn’t quite hide his shock over the decision, much to the amusement of his Palace teammate. Either way though, they’ll all undoubtedly be delighted to have picked up three crucial points to move them up the table. *John Harston selects James Tomkins as Man of the Match*@wilfriedzaha: "Oh, wow! I'm shocked!" ?? Having scored twice, Zaha is having none of it! ? ?